A premium water based adhesive for the installation of vinyl tile and carpet over wood and concrete. Manufactured with a mixture of resins, latex polymers and chemical additives to produce a high quality and versatile product. 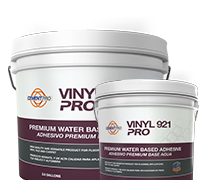 VINYL 921-PRO is easy to use, has a strong initial grab, excellent bond, ample working time and can be used for a wide variety of flooring applications. Available in 1 gal. and 3.5 gal. Multipurpose floor covering adhesive for use in interior, ideal for commercial and residential installations. Specially designed to adhere vinyl tile and carpet to structurally sound and moisture free concrete subfloors, plywood, cement screed and underlayment, hardboard, terrazzo, ceramic tile, marble, stainless steel. Is ideal for vinyl tile, vinyl plank and solid vinyl. For the installation of indoor carpeting (carpet backed with jute, polypropylene, urethane foam, etc. ).